I’m Proudly Jewish and I Love Christmas—Is That So Wrong? Some might call me a paradox wrapped in an enigma: I’m a proud cultural and spiritual Jew who likes—no, loves—Christmas. I can feel your eyes judging me as I type these words—and by the way, I’m also singing along to Michael Buble’s “It’s Beginning to Look a Lot Like Christmas” while a Christmas wreath-scented candle flickers softly beside me. But I will not be Christmas-shamed. Today, I wish to speak for the Jews who for decades have hidden their affection for the Christmas spirit. You know who you are—and you are not alone. My Jewish credentials are top notch. Both of my parents are Jewish. All four of their parents were Jewish. I did eight hours a week of Hebrew school at Temple Emanuel for eight consecutive years. I still remember my Bar Mitzvah Torah portion and sometimes sing it in the shower. I have never missed a Passover Seder and I’m such a Pesach badass that I use the real white horseradish in my charoset and matzoh sandwich. I always know the answer when you ask me: “Is (actor/athlete/other famous person) Jewish?” I keep an emergency yarmulke in the glove compartment of my car in case of an emergency minyan. I’ve been to Israel so many times I can tell you where to find the best bathrooms at Ben-Gurion airport. But there’s another side to Alex Goldstein. A side that emerges but once a year, erupting like an eggnog geyser from a steaming hot cauldron of matzoh ball soup. The transformation begins around mid-November, when my Spotify playlist transitions to the James Taylor Christmas album and the soundtrack to Polar Express. 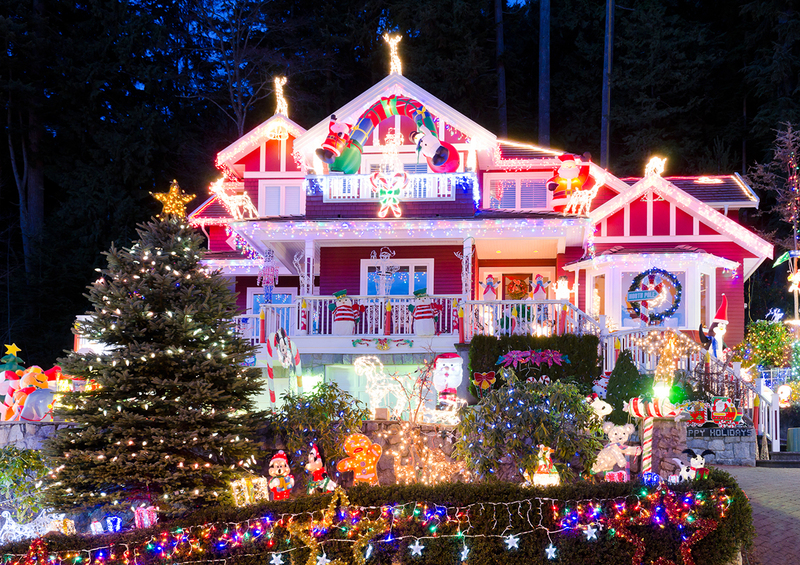 By early December, a short drive can become an hour-long journey as I veer miles off course in search of a good residential Christmas light display. I have uncomfortably aggressive opinions about what color lights look best on a Christmas tree—multi-colored—and will watch even the worst Christmas movies on TV (check out Jack Frost 2, Revenge of the Mutant Killer Snowman). Long after the Hanukkah candles have melted and gifts exchanged, you can find me at the Natick Mall, the day before Christmas, trying to soak in the waning ambiance of the season and spreading cheer to stressed-out last-minute shoppers who are inevitably flipping each other off over parking spaces. Hmm. Maybe there is something wrong with me? To figure out where I went wrong on my spiritual path, I did what any good Jew would do: I consulted not one, but two rabbis—one Reform and one Hasidic—whose respective efforts to build vibrant Jewish communities in Boston, particularly among young adults, are legendary. Rabbi Matt Soffer—of Boston’s Temple Israel, and head of the young adult focused Riverway Project—suggested I pour myself a cup of hot wassail and calm the hell down. Wow. Forgive me, rabbi, for choking on my ruggelach, but it’s against my nature to accept a diagnosis that assuages my hereditary guilt and lets me off the hook. So I explained my symptoms to Rabbi Mayshe Schwartz, spiritual leader of the Chabad of Brookline’s Chai Center and asked him, Rabbi, should I feel like less of a Jew because I enjoy a good Yuletide shindig or two? Whew. This December 25, I will do as I have done for years and head to the party—joining dear friends for two Christmas dinners. I will eat, drink, and be merry in the truest form of the spirit, and I will not feel guilty. The rabbis are right: there is something extraordinary and uniquely American about being safe and secure enough in your own identify that you can revel in the traditions of those that are not yours. So lucky am I to live in a community where I can do just that.